This Our Garden Gang feature is primarily for those of you in the colder climates. For all those in warmer climes – consider yourself lucky! I myself actually love the changes in the seasons. I am a woman who likes variety in her life. There is nothing better than snuggling in front of a toasty fire with the snow falling gently outside (mouseover my pic to see my favorite ice whine!). Ew! I'm getting nostalgic again. If you are "overbored" and live in a northern climate, you know that snow can be a four letter word. So why not make the best of it? Have an outdoor party! But there is some prep work involved. For this project you'll need two graduated-size mixing bowls, a wooden skewer, a roll of sturdy tape and pebbles or something heavy enough to weight down the smaller bowl. The greater the size difference between the bowls, the thicker and longer lasting the ice bowl will be. To begin, fill the larger bowl about one-fifth of the way with water, and set the smaller bowl inside it. Place in the freezer until the water has frozen, forming the base of the bowl. Remove the bowls from the freezer, but don't separate them. Now begin to place your decorations between the two bowls, pouring more water in gently and stopping an inch or two from the tops of the bowls. Put pebbles or a heavy object in the smaller bowl to keep it in place. Use the skewer to adjust the decorations as needed. Once everything is where you want it, tape across the tops of the bowls to keep them even; otherwise, the smaller bowl will rise as the water freezes, altering the shape of the ice bowl. (Put your cursor over the ice bowl above to see how it should look at this point.) Now the bowl is ready to be placed in the freezer overnight. Immediately before the ice bowl is to be used, remove it from the freezer. Pour warm water into the smaller mixing bowl, and work it free from the ice bowl. Then run warm water over the outside of the larger bowl until it separates from the ice or place the bowls briefly in a sink or larger bowl half-full of warm water. You can then serve your guests snacks in them – or might I suggest a cold soup? One thing for sure, whatever you put in it, it will end up cold anyway! For refreshments, might I suggest a lovely ice wine? Magnifique! Mouseover the pic of my favorite ice wine at right to see my favorite ice whine! For your centerpiece, take your watering can or bucket and collect the ice covered broken branches and twigs that have fallen from the trees. Insert them in your containers. And the best thing about it – it’s free! The buffet table could be your picnic table from last summer or might I suggest – if there is enough snow – make a bar out of stacked snow. Flatten it smooth by hand (with mittens on of course). You can get fancy and make animal shapes like my snow bar above, and decorate with an ice sculpture (put your cursor over the snow bar to see the sculpture). Put a piece of your leftover fine oak paneling or if you must – some plywood - on top of the buffet and Voila!!! Now you will have a handy serving surface or bar. 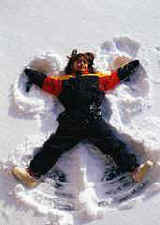 Let’s see – for some outdoor activities you could have a snow angel contest. 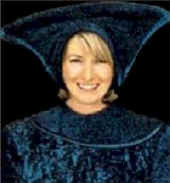 Make it a perfect angel, and make sure there's a halo (use a hat like mine)! But of course everybody wins! 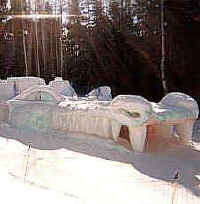 Put your cursor over the snow angel to see my ice rink! What about flooding your backyard and creating your own private ice rink? You never know, you might have a world champion or two in your midst! Don’t worry about any lawn sculpture or raised flower bed that might be in the way, you can teach your guests how to do a triple axel right over it! Don’t forget to wear your sunscreen. Even in winter the sun’s rays can be damaging. After all, it’s how I retain my youthful glow - other than with a little ice wine. Happy winter! I hope this has given you a different perspective on the blah days of January. Try some of these suggestions and I guarantee you will have a party no one will ever forget!